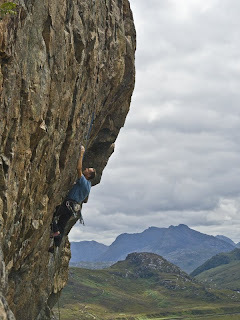 'Big Stone Country' epic Scottish climbing book! 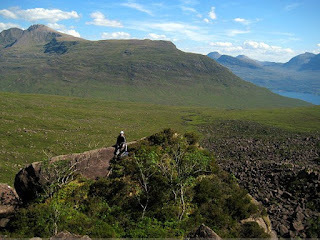 We are currently seeking photography for the next exciting project from Stone Country Press – Big Stone Country – A Selection of Scottish Mountain Climbs (draft title). 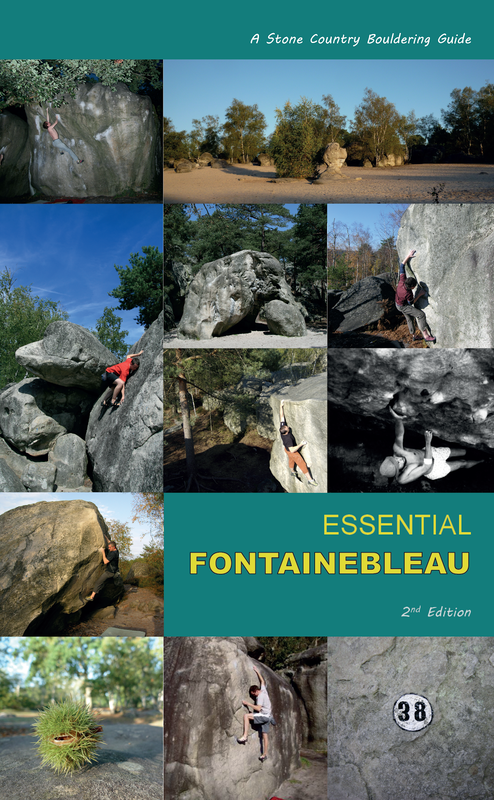 Unlike the previous (bouldering) guides, this book is intended for much wider consumption; it will be structured around the great Scottish mountain crags, featuring both summer and winter climbs. Guy Robertson will be the editor in chief. The core purpose of the book is to profile Scotland's best mountain crags and inspire people to climb in the hills, keeping the focus primarily (but not exclusively) on more recent historical developments and routes. We’re aiming for the ‘contemporary traditionalist’, and hope to both challenge and inspire. If you would like to contribute photography, or you have a photograph of a classic Scottish modern extreme or winter route over Grade 5, please submit a jpeg or two to Guy or myself. All photography will be remunerated, or if you would like a commission to take a particular shot, please get in touch! Aesthetic - i.e. following a good, strong line. The older I get the more the 'things to do' list gets bigger, not smaller. When you're a young climber, you think you have all the time in the world, every route will get done and this list will just get smaller, but in the end there will just be more climbing out there than when you began this vertical game. 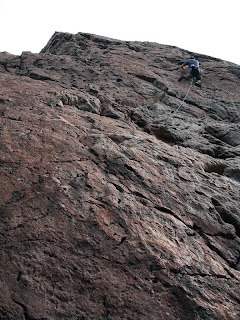 It sounds contradictory but it's true, and with too much work on my hands and too many sacrifices made to bouldering, I felt I needed to attend to this list and get back into the 'management game' that is trad climbing. Conscious of ticking time and this withering rule of climbing physics that routes are only done in the present, I phoned the ever-reliable and super-keen 'Crofton' who had a week off between doctoring jobs. We trawled the forecast online and on Tuesday night it looked like Sutherland and Wester Ross were escaping the bands of August flood rains approaching from the Atlantic. We bolted up early on the Wednesday morning and drove past Garve and Wyvis up onto the Inchbae plateau, past the Altguish to an astonishing sight - the parched and barren desert of stones that was the Glascarnoch reservoir. Even the old Ullapool road had appeared out of the drained depths, a lonely segment of hard-tack like the sunken page of an old map. The weather parted into blue skies and a cool north-easterly breeze killed off the 'midgery' . The weather has been ominously dry all year in the North West, so we were acutely aware of making the best of the weather. Advice from Ian in Ullapool shunted us further north west to the 'end of the road' at Sheigra in the far north west, where geology ends in the frozen time-swirls of Lewisian Gneiss. The 'Second Geo' at Sheigra is possibly the most geologically artistic piece of rock architecture in Scotland. Turning the corner of the bitten machair onto the glaciated slabs of the approach leads you to the giant sandstone erratic from where the crag can be viewed in its glory. A 'geo' is effectively a wave-cut slash into the coast, like a wedge out of the coastal cake. It tends to leave steep walls over roiling channels of angry sea. Today the sea was calm and lucent, kelp waving in the turquoise fringes and seals treading water with white 'hand-claps' and sniffing us curiously with whiskery wet noses. This particular wall of rock is remarkable for its generous pocketed red and tan gneiss walls rearing out above a deep and gloomy cave, with lines tip-toeing out from hanging corners above the intimidated dots of two keen climbers! We checked the guide for the four-star routes that the SMC had recently introduced - as Sheigra's second geo has nothing but three star-routes, something had to be special for the fourth star! The names of the routes-to-do are a long litany of delight... Bloodlust Direct (the four-star route), May Tripper, Wanderings, Geriatrics, Persuasion, Dolphins & Whales... we geared up eagerly and Adrian set off straight up Bloodlust direct which breaks through ridiculously steep ground on deep-set pockets . The trucking headwalls are a delight and we enjoyed the black basalt Zorro slash that is Maytripper just as much. Possibly the most stunning route here, which should get four stars simply for its exposure and situation (the actual climbing is remarkably friendly for E2) is the awesome cave traverse and headwall of Geriatrics. A fantastic abseil belay on a cosy black ledge on the right of the booming cave allows the leader to step off left into a bottomless groove with wide eyes and nervous songs of distraction. He need not worry however, as the gear keeps coming and the holds appear at will along the cave lip. The final red headwall in a spectacular position leads through a few steep pulls to easier ground. It is a pitch to delight in for both leader and second, you simply have to look down to take in your position at times, the rule is to spend as long as you can on the wall and do it in the evening sunshine to catch its full flush of glory. The next day we cracked off a few steeper lines in the shady first geo, highlights being Blind Faith E2 and the excellent crack-line of Monkey Man E3, a pumpastic route requiring quick gear placement and a confident approach monkeying between distant good holds. This route was where I came to relearn the art of management in rock climbing - composure under stress, constant committee-meetings in your head at each point, the green-lighting of decisions, the red-lighting of caution, the terrible amber indecision of whether you have made the right choice... all these things are what rock-climbing is really all about at your own personal limit. You assume a certain competency of skills, you have the techniques, the gear, now all you have is the route and the management of that route. You break it down into constituent parts, for the whole is too big and terrifying, you micro-manage these sections with gear placements and sequence decisions, then you go into the 'blank space of action' for a bit, then you are back at a hold managing your position, delegating shake-outs, administering to your body's taxes... often the whole thing collapses in panic and stress and over-work and you bin off, your shares plummet and you're left at the bottom of a rope kicking rock. Such is the art of management in climbing. The evening saw a fresh breeze keeping the midges at bay so we meandered along to the wonderfully textured wall of Creag an Fithich at Achriesgill. Gearing up, we are passed by a dog-walker returning from the pub at such a walking pace his wee dog was panting in the heat. 'Trying to break my record back from the pub', he says with a well-oiled smile. 'The wee dug's knackered tho', cannae stop, seeya lads...' Everyone in the north west has this slightly glazed and weathered visage, I can't tell if they're drunk or just ecstatic. We were ecstatic to be standing under 'The Swirl' - another four-star gneiss E3, striking up the direct feature of the 'swirl' itself and taking a high crux headwall in a bold position. It binned Adrian off just below the top at a creaky flake and a hasty retreat was made to recover the gear the next morning! A spectacular line but hard for the grade and one we will have to consign to the ever-expanding future of 'routes-to-go-back-to'. Friday dawned glorious again and we headed south to collect Ian from Ullapool for a day at the Gruinard crags. These have seen furious recent development, both trad and sport, from locals Paul Tatersall and others. 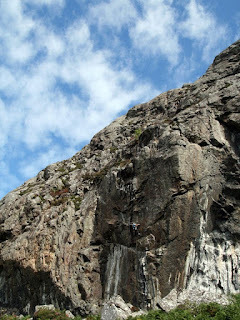 Possibly the leakiest secret in the north-west is the sports climbing at Goat Crag and Am Fasgadh near Mungasdale. These sunny crags look out over the Anthrax island of Gruinard and the beautiful 'stone valleys' towards the Fisherfield twin hills of Beinn a Chaisgein and A Mhaighdean. The River Gruinard winds silvery down through the glen and the crags dominate the hillsides with tan, black and red walls of delightful steep climbing. 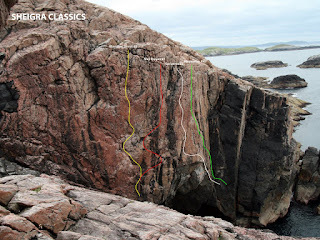 Goat Crag was a real surprise, the sports routes as good and long as Cave Crag in Dunkeld, long and pumpy and sequency, especially the classic four-star 7a+ that is Mactala. 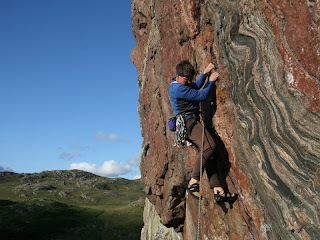 Ian Taylor led a new E5/6 called Eightsome Reel on the spectacular arete and headwall of the left crag, before we eased off the pedal on the freindly Jetty Crag, with ascents of the classic Prizefighter (named for a fisty reason! 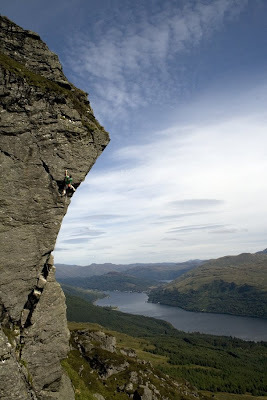 ), the delicate North West Arete E1 5b and the steep Right Charlie E2 5c. Friday had come all too soon and we had to motor back down the road, our brief adventures in Gneissland over for another year. 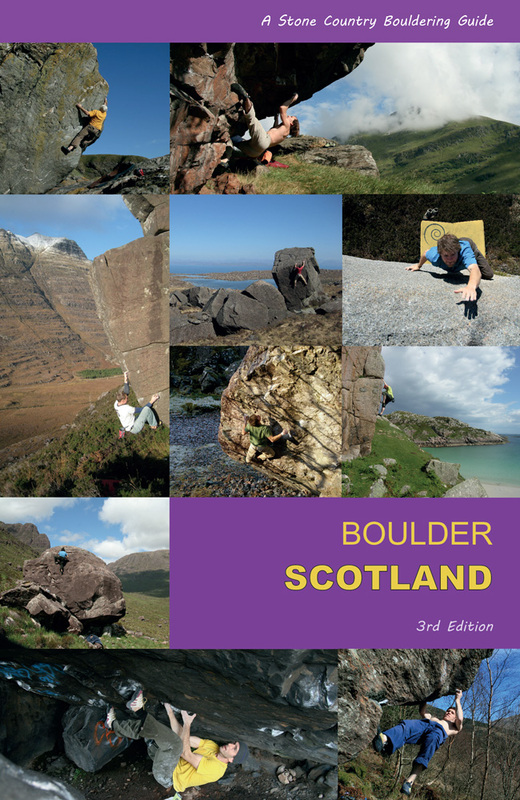 Dominic Ward and Lee Robinson have been busy exploring the remoter possibilities of bouldering in Applecross & Torridon and they sent me some topos of new bouldering for the Stone Country Bloc-Sport Guide for the NW. There seems to be no shortage of potential and the recent good weather allowed bikini-clad walk-ins (for Lee and Lisa anyway), who found billions of boulders under the Horns of Alligin it seems... an impressive field, makes me think of that scene in the Matrix when Neo is shown the billions of cloned humans! Nic Ward followed the attractive siren calls of the boulder field visible below the Bealach na Ba mast in Coire nan Cuileag and found the gem that is the 'Sanctuary' boulder, a good looking roof offering a little shade for tired and thirsty dogs as well as boulderers! GR - 777 428 The boulder is NW facing, and is visible from the Applecross side of the Bealach, on the way up to the mast car park. It lies below the mast in the field of vision marking the SW end of a rock terrace and has a large white streak of lichen distinguishing it from the surrounding rock. 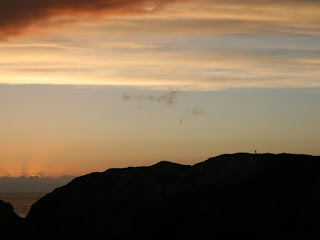 To access either walk direct from the car park, approximately 300m across broken terrain, or walk up the mast track for 200m and cut off left down a shallow valley following one or two rock steps. The boulder marks the south western end of the largest terrace in the vicinity.